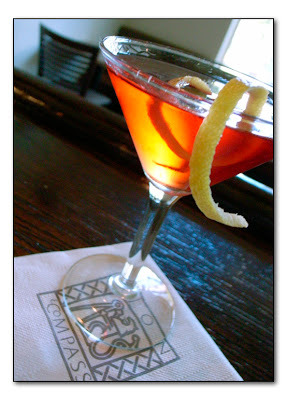 This was an original recipe I submitted for a recent Campari competition. 4) all ingredients should be available at any local grocery and liquor store. The cocktail should also be created as an introduction to to drinkers unfamiliar with Campari. Campari is not the easiest ingredient to work with, but I really like the flavour. I think you can go in two different directions with this contest. You can either try to soothe the strong flavors of Campari with something like orange juice, or you can celebrate the Campari by bringing out the bitterness. I embraced the bitterness and went for an old-style cocktail featuring Campari, Brandy, Maraschino and Bitters. Try out this recipe and let me know what you think. If you've got a great Campari recipe I'd like to see that as well. If I find out what the winners are, I'll post them here. I've been working on a bitters recipe lately, for the upcoming Bitters Exchange (more details to come). My underground lab has been full of strange herbs and spices including Bitter Orange, gentian, cinchona and even tonka bean. I've even been combing the local forests for some artemisia californica for someone else's bitters recipe. This Month's Mixology Monday is hosted by Gabriel over at cocktailnerd. The theme is "fizz." Since I've been preoccupied with bitters, I thought I'd cover a traditional basque fizz, the Picon Punch. One of the key ingredients in the original recipe is Amer Picon, a type of bitters based on bitter orange and gentian. Amer Picon is no longer widely available, at least in it's original form. It seems at some point in the past, the Amer picon went from 78 proof to 39 proof. The best substitute for the original Amer Picon is Torani Amer. The consensus view seems to be that the Torani product is more like traditional Amer Picon than the current version Amer Picon. The Torani product seems to be more widely available as well. Dash some real pomegranate grenadine into a tall glass. Swirl to coat the glass and fill with ice. Add 2 ounces of Torani Amer and top off with 1 - 2 ounces soda. Twist a large swath of lemon peel over the top.